This PDF 1.5 document has been generated by Microsoft® Word 2010 Trial, and has been sent on pdf-archive.com on 21/11/2013 at 17:26, from IP address 180.194.x.x. The current document download page has been viewed 616 times. File size: 615 KB (11 pages). the sympathetic nervous system and RAAS. dysfunction due to LV hypertrophy). patient to chronic prolonged anticoagulation. - Anticoagulation is a risk for bleeding. preserved glucose metabolism and contractile reserve. may be difficult to distinguish. elevated LV filling pressures, particularly in noncompliant ventricles. 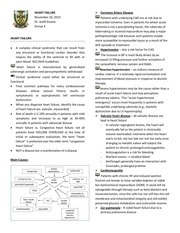 dysfunction in patients with HF. also worsen the condition. It is a vicious cycle. are frequently absent in patients with chronic HF. occur most commonly with biventricular failure. pressures will similarly remain elevated at end diastole. elevations of both direct and indirect bilirubin. periods, avoidance of strenuous exertion. Not isometric – muscles become big e.g. has no role in diastolic dysfunction. than 1 liter has a very dramatic improvement, ex. Next thing to do if patient shows no improvement? before he undergoes heart transplant. This file has been shared by a user of PDF Archive. Document ID: 00135975.